We've reached the official beginning of summer, and the city is exploding with fun outdoor events to celebrate the warmth. There's a long weekend upon us, the whole world is celebrating pride right here in TO, and Canada is turning 147 years old. It's a great week to be in Toronto. While Toronto has always done Pride Week right, this year marks the first time that World Pride is happening here, which means it's bigger and better than ever. Live music, art, theatre, film, dance, DJs, comedy, and drag and burlesque acts will fill the city with a fully realized celebration of all things LGBT. This year's Pride Parade is one you will certainly not want to miss out on. It's no surprise that Toronto is spoiled with music festivals, and Toronto Jazz Fest has long been a reason for that. This year, catch performances by Measha Breuggergrosman, Chaka Khan, Earth Wind and Fire, Keith Jarrett and so many more. The classic Monty Python musical comedy hits the LOT this summer to tell the tale of the legendary King Arthur and the Knights of the Round Table. This is the play that gave life to the beloved song Always Look On The Bright Side Of Life. I can't wait. The name of this event speaks for itself. Come get all the ribs you can eat. Arrive hungry, leave stuffed with meaty, BBQ goodness. 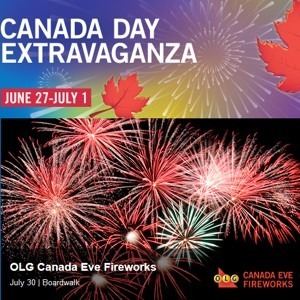 The fact that Canada's 147th birthday falls on a Tuesday means that this weekend is going to expand into a 4 day weekend for many as the celebration begins on Saturday and sticks around until Tuesday. Harbourfront will be, as always, bringing on a true extravaganza in celebration, with artists, music, ideas, Canadiana, and of course - fireworks. Show Canada how thankful you are for being born within its vast, remarkable glory by partying like only a Canadian can.